Climate change. Those two simple words have the power to bring about a strong reaction in people. For many, the term is fraught with emotion—with worry, anger, and fear of the unknown. For others, these two words might elicit doubt or frustration. 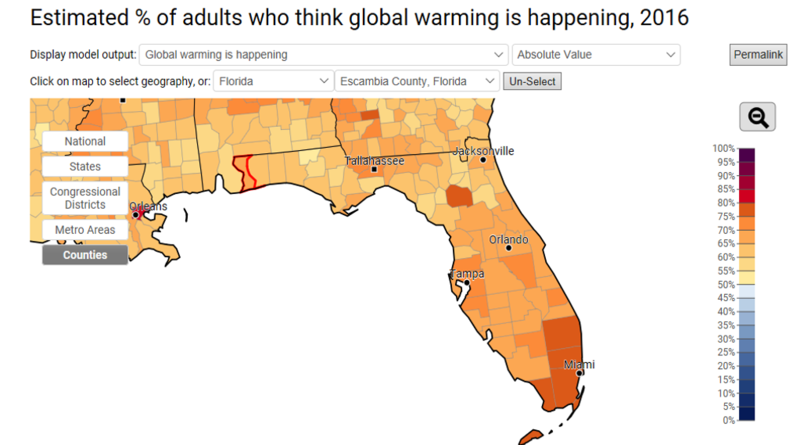 According to a multi-year, nationwide study conducted by George Mason and Yale Universities, as a country we react to the science of climate change along a spectrum of responses. On one end of the spectrum, people are “alarmed” (see a change in climate as a reality and taking action about it) and “concerned” (believe it is a serious issue but have not taken action). In the middle are those in different stages of understanding or awareness of climate issues, and characterized as “cautious”, “disengaged”, or “doubtful.” At the opposite end of the spectrum are the “dismissive”, which are that group of people who are actively opposed to action on climate change and may feel it is a conspiracy. These six categories were based on the responses of a large, in-depth survey conducted in 2008. Ten years later, researchers conducted the study again to see if attitudes had changed. Interestingly, they had—with the most noticeable shift out of the “disengaged” category, as people seemed to cast their lot with one side or the other. Looking at the data, respondents left the “disengaged” group and moved either towards doubtful and dismissive or towards the cautious category. It is likely that the 3% change out of “concerned” moved directly into “alarmed”, as extreme weather events and record temperatures over the last 10 years brought the impacts of a changing climate closer to home. When the study is broken down by region, a minority of northwest Floridians believed human activities such as carbon emissions caused climate change. However ~65% of the same group believed climate change was happening (regardless of cause), and 80% responded that our country should fund research looking into renewable energy. The good news here is that while many of us do not agree on the cause of climate change, the majority of us agree on positive steps forward that may relieve some of its results. For me, the take-home message of this study is that scientific understanding—on many issues, not just climate—is often along a spectrum based on exposure to research, personal interest/relevance, and cultural influences. When explaining any science-based concepts, it is important to know where your listener is coming from and start from there. It is unfortunate that we are in a time when many principles of science are taken as political positions and not products of unbiased scientific method. That being said, great thinkers from Galileo to Hawking have had their run-ins with popular opinion. 2nd and 3rd hottest years on record were 2015 and 2014. For more information on climate science, check out these resources: Intergovernmental Panel on Climate Change, NOAA Climate, and NASA Climate.